There are no two opinions in saying that online shopping is the future of Indian commerce industry. With each passing day, every thing be it small or big is being displayed on major online portals to capitalize a maximum number of population. Due to this, the growth rate of e-commerce websites is humongous. Now, this ever increasing number of online shopping websites has some disadvantages as well. Online shoppers tend to get confused to decide whether they are paying the right amount for a particular product or not. Here right price means lowest price. To save time and money, price comparison websites cropped up ( are cropping as well). Out of all price comparison sites available online for smart shopping experience, PriceRaja.com is one which helps buyers to make efficient and smart choices when it comes to online shopping. It allows online shoppers to get all information about the desired product at a glance. Why it is better than the rest? Here are some points that make PriceRaja.com a more comprehensive way of online shopping. India is a price sensitive nation and while shopping, particularly online, buyers tend to be more alert and cautious and try to grab the best deal available for a desired product. On PriceRaja.com, you just need to enter the product you are looking for and rest all will be carried out by the domain. In a couple of seconds time, you would get a complete list of all prices available on different online sellers. Not only this, the domain also showcases the best lowest prices at the top of the product page. Thus help you to get an idea of a product’s price. There are times when you will be not interested in zeroing the lowest available prices as the online store has low goodwill in the market. In that case, you just need to scroll down a little and select your favorite store to buy the product. Finalizing the store you want to make a purchase from is the first step when it comes to online shopping in India. Next step would be is the product that I am looking for worth buying. Am I purchasing the best product available in the market. The comparison site also helps you to find the best product as well. When you logged in to PriceRaja, you will witness specification score and a value for money indicator with every product. This gives you a fair idea as to how good and worthy the product is considering its price. This guarantees a more sensible buying decision. 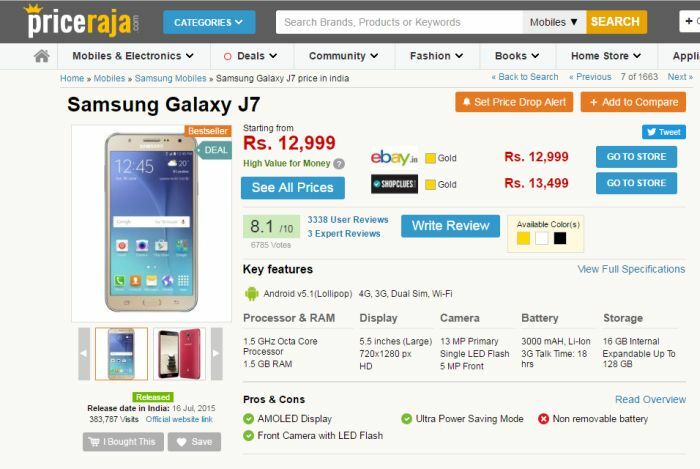 As mentioned above that PriceRaja not only restricted to showing all the prices available online on a single page, it also gives you an option to compare upto 4 products at once. This the best way of online shopping when you have a confusion in your head among two or more products. This confusion generally occurs when you are purchasing a new smartphone. Using PriceRaja comparison tool will give you comprehensive and detailed information about devices and products. This enhances your buying decision. With so much competition among different sellers online, the chances of price drops are frequent and prompt. You will be informed promptly by PriceRaja whenever there is a price drop on a product. For that you need to set the Price Drop Alert button. You will be notified through email each time the price drops. Apart from all product related information, PriceRaja also features a deal section on the website that showcases all recent deals and offers available on the net. This section helps users to save some extra money on their next purchase. The section has been structured well according to stores, product type as well as top deals of the day to ensure users have the best shopping experience.The domain also gives you an option to save money on the go. You just need to install PriceRaja App, which is readily available for download from Google Play Store. It will constantly keep you updated with all deals and offers via push notifications on your smartphone. Priceraja.com has some cool and worthy features that makes your online shopping experience a memorable and cheaper one. This domain satisfies all your online shopping needs and at the same time saving you lots of money and time. PriceRaja.com is my first choice if I ever wanted a mobile or any gadget to bought . I love the fast loading and easy navigation of the website which makes user know about all things in detail. Price comparisons is the best feature I love in PriceRaja. You can try the new PriceRaja Android App by clicking the link below! Next article Must Have Gadgets Of 2016 !